I normally go hiking at least once a week, but when the days are longer that number jumps to three or four. My wife and I have been busy renovating a house, though, so my average trail days have plummeted to one every few weeks. With that in mind, it didn't take long for me to decide how I'd spend an extra day in the Adirondacks. In fact, my response was immediate: Go on a hike. And what better destination than an old favorite that I haven't visited in a couple of years? 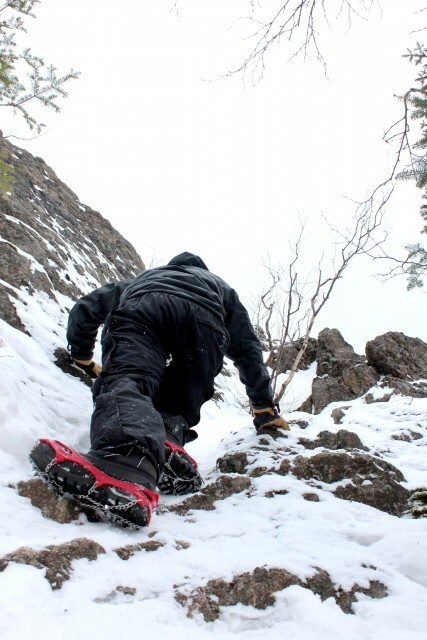 Jay Mountain is a special place for me because it's one of the first non-High Peaks I climbed. It was there I discovered that views of the big mountains are just as impressive of views from the big mountains, and they're usually easier to get to. Usually is the key word there, as I recently learned that even smaller summits are capable of imposing insurmountable challenges. The allure of Jay Mountain is undeniable to me. 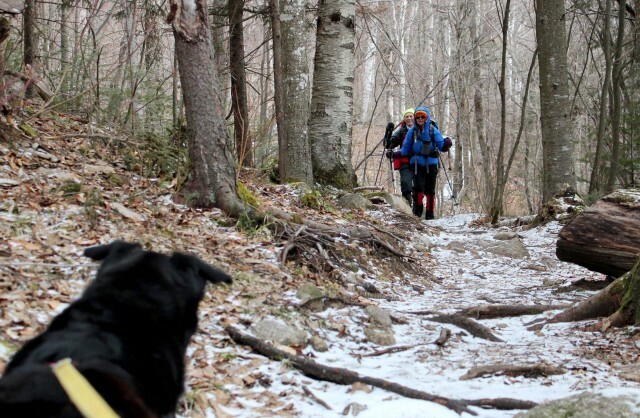 It's really a perfect hike — the first half follows gentle to moderate grades as the path zigzags through hardwood forests and stands of evergreens, then the trail delivers the hiker to the end of the long, rocky spine that curves its way to the mountain's summit like an enormous snake. The ridge is the kind of place that usually takes several hours of clamoring to reach, the kind of place that is reminiscent of the summits on some of Jay's more imposing neighbors. The trailhead is on country Route 12 in Upper Jay. Turn onto that road from state Route 9N and follow it for a few miles. The parking area is on the left, just before a fork in the road. This is the start of a relatively new trail. The original started a little farther up the road and was marked by things like paint blazes and ribbons. The current trail has a nice, wide pull off for parking and is well-marked with bright blue disks. There's even a trail register and map at the beginning. The path begins gently and rarely gets steep. This is a departure from the old trail, which frequently charged straight up the mountain. The redesign accomplished two things. The back-and-forth trail makes it easier on hikers and their knees, and it also helps maintain the integrity of the surrounding forest by decreasing erosion. 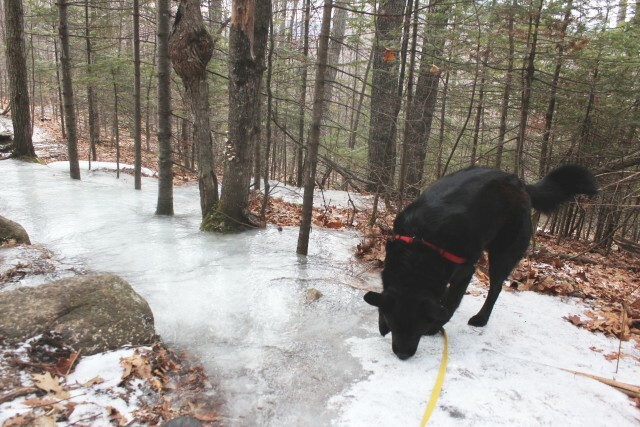 I saw evidence of this along the few short, steep pitches of the trail, which were coated in a thick layer of ice. Water always follows the path of least resistance, so straight, steep trails often resemble streams when the weather is wet. Since the trail mostly goes through hardwood forests, which are leafless this time of year, the views appeared right away. At the top of the first pitch, I turned around and was greeted by the hulking mass of Whiteface Mountain. It followed me during the hike, growing larger and more impressive as I gained elevation. The trail skirted the top of a wooded mini mountain that was between the road and my destination. Then it dipped down slightly before beginning its climb up the side of Jay. The going was easier than I remember, but I'd be remiss if I didn't mention two features I miss from the old trail. 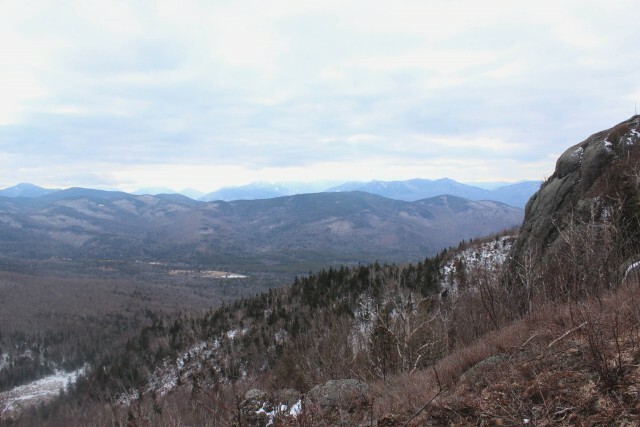 The first was an open red pine forest, where there were straight-on views of Whiteface no matter the season. The other was a stretch of open rock on the side of the mountain. I have a fond memory of stepping out onto that rock one summer and being surrounded by dozens of dragonflies, which took flight with every step I took. No matter; I'd be on open rock soon enough. Shortly after climbing over some blowdown and ascending a steep pitch, I found myself in an open area that contained a lot of young red maples. The next stop was the ridge, where there are two choices: Bearing left leads to a knob of open rock that's a worthy destination in its own right; right begins the trek along the narrow ridge to the summit, which is in full view for the rest of the hike. I went right and immediately remembered why I've always loved this mountain. The trail undulates as it passes through wooded stands that appear like islands in the sea of rock. There are small meadows that burst with color year round — in spring, summer, and fall they are rife with bright wildflower hues, and in the winter the fawn-brown grasses and deep-green mosses appear in brilliant contrast to the gray-blue palette of the season. I hiked through this wonderful landscape until I was stopped by a formidable feature not far from the summit. Like Everest's Hillary Step, this enormous hump of stone curved skyward and was bedecked in snow and ice. I probably could have climbed it, and I probably would have been able to get back down, but I don't like the word "probably" when I'm 3 miles from the road and the dog is my only companion. After climbing a few feet up the chunky, bulging surface, I knew it was the end of the trek. I gingerly descended back to the safety of the forest and took a moment to marvel in the enormity of the place. There I was, near the top of a mountain, surrounded by rock, snow, and ice. I decided to enjoy the walk back instead of risking injury in a windy, remote place. The views and the landscape would still be there and I'd certainly be back, no probably about it. I just need to find myself another extra day. Taking a hike on your extra day? Don't forget to grab a bite to eat. Would you rather spend your extra day closer to civilization? Take a walk through High Falls Gorge, ski or snowboard at Whiteface Mountain, or take a stroll through history. The coolest way to relax. Leap into hiking with CATS. 10 day trips you should take.